This is the definitive account of an extremely influential movement in political history. Robert Owen has often been described as the ‘father of English Socialism’. Despite being a high capitalist himself, he believed that the advancement of humankind could be furthered by the improvement of every individual’s personal environment. This ten-volume set reprints an extensive collection of Owenite Socialist and co-operative material, the bulk of which are extremely scarce and difficult to find outside of specialist research libraries. The volumes are arranged in chronological order, tracing from the beginnings of the movement up to the late 1840s when there existed many co-operative societies. 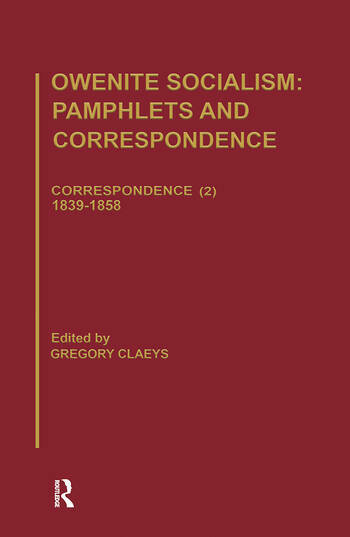 The collection also includes the writings of several of Owen’s socialist contemporaries including Abram Combe, Henry McCormac, William Hawkes Smith and George Fleming.